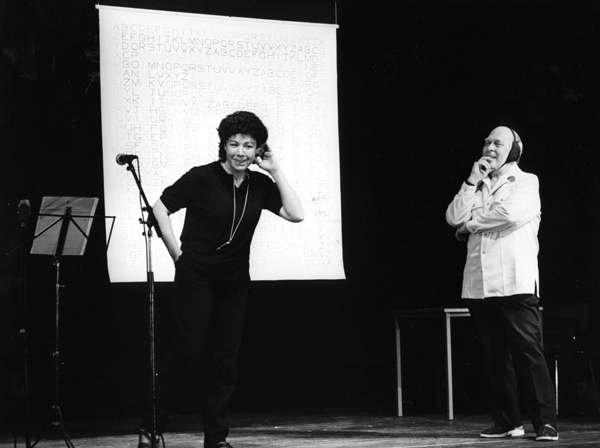 Ann Noël announced that the evening’s programme would be a performance based on an alphabet square by Emmett Williams. The alphabet square was mounted on the stage behind the performers, who in addition to Ann Noël included Emmett Williams and their son Garry Williams. 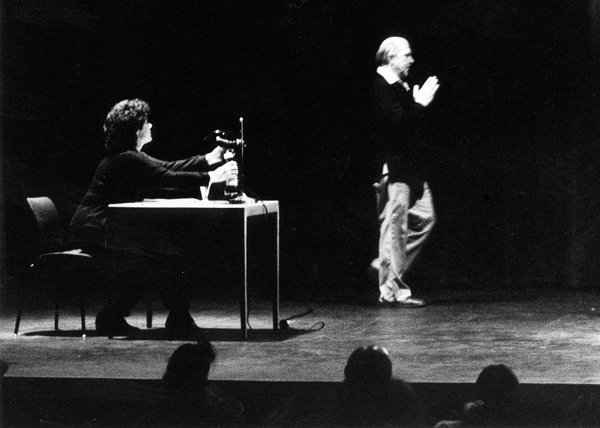 Ann Noël explained that pauses would occur throughout the performance when the performers were unable to come up with answers. In these instances the performers would blow a whistle and the audience could fill in the blank spaces. 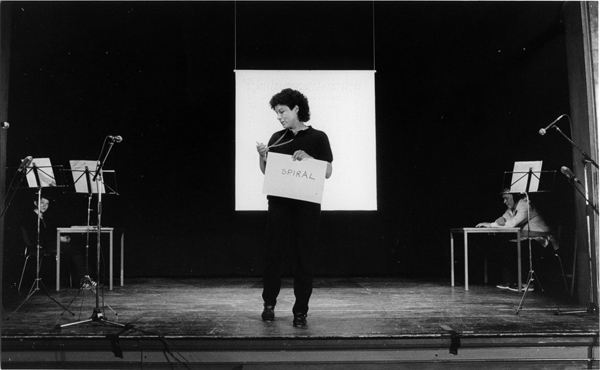 During the 80 minutes performance the three performers presented a vast number of word games based on the alphabet. 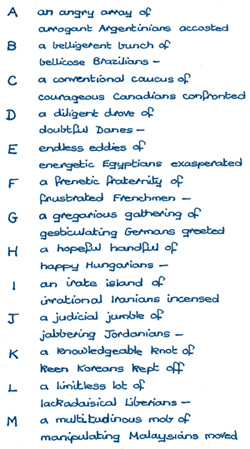 A number of categories – alcoholic drinks, food, artists, art categories, actions, psychology, duets, songs and composers – determined the theme of the various alphabet games. 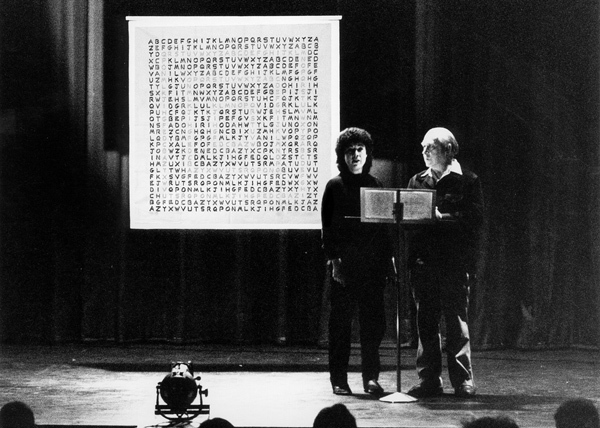 Often the words were just spoken alphabetically, but on the theme of actions Emmett Williams spoke the actions, and Gary Williams and Ann Noël performed them: Algebra, blow bubbles, bow, cola, camera, drink, dance etc. 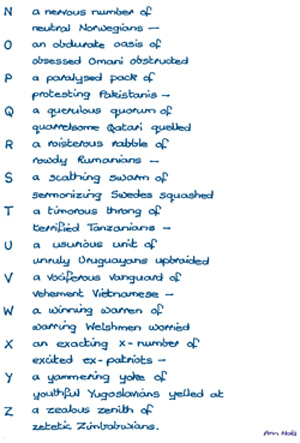 Each alphabet game traversed a new part of the Alphabet Square, starting from the middle and working its way out. Throughout the performance which also included games of abbreviations, saints and nursery rhymes, Ann Noël regularly pointed out the progressions on a spiral of letters.